The M.C. Cutlery diamond sharpener was designed and manufactured for commercial use and abuse. Manufactured in Germany, the M. C. Cutlery diamond sharpener has features only seen in diamond sharpeners twice the price. By being the exclusive North American distributor of M. C. Cutlery sharpening products, we are able to offer quality at an affordable price. Features: 1. State of the art synthetic handle conforms to the shape of your palm; 2. Handle is ergonomically shaped for comfort and features a finger guard for safety; 3. The core of the sharpener is a solid piece of chrome-vanadium steel and therefore is stainless; 4. Additional hard chrome plating gives the surface even greater abrasion resistance; 5. The diamond particles feature a particular shape to ensure optimal honing of the knife edge; 6. The extremely fine granulation guarantees a smooth, sharp and durable knife edge; 7. Up to 2 million diamond granules are coated onto the sharpener; and 8. The sharpener is unbreakable under normal commercial use, making it safe in food preparation environments. Main difference in the M.C. Cutlery sharpener and other brands. The M.C. 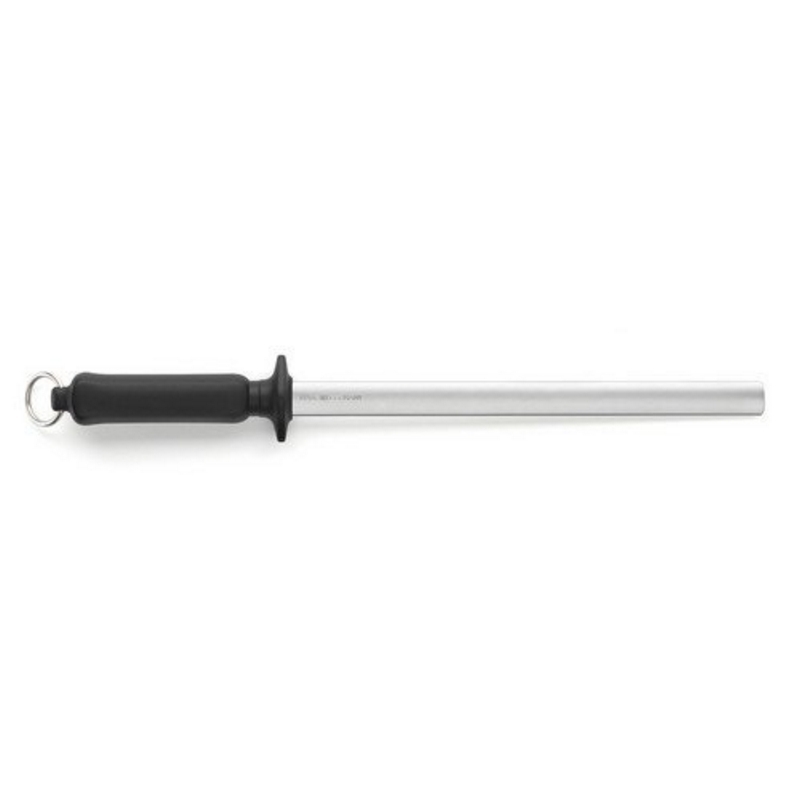 Cutlery brand uses only high quality steels, and manufactures a solid core sharpener - others use steels that easily rust or corrode, and featuring hollow cores that are easy to bend and break. M.C. Cutlery sharpeners use monocrystillane diamonds, which are more durable and provide a more consistent sharpen than the less expensive polycrystillane diamonds. M.C. Cutlery uses a full coating of up to 2 million granules of diamonds, providing a smooth sharpen, while other brands use a fraction of the number, or they don't fully coat their sharpeners. Rod length is 10", oval shape. Oval shape provides more contact surface to help aid in the sharpening process.